As "Auge" himself says in the liner notes, he was "shocked from a warm horse trough of rancid risotto one afternoon by the news that the King of Marmalade had commissioned me to make a solo LP" that "lies along a straight line drawn between pop and jazz and aims at the fusion of both elements," something "the group has been trying to do for the past two years." Unfortunately, that informative quote turns out to be the most creative thing about the LP as their lofty aspirations proved to be more admirable than the final product, "Definitely What!" Their bold but overly contemporary rendering of The Beatles' "A Day in the Life" starts things off. Somehow they manage to take any and all excitement out of the song by making it all sound too "groovy" and "swingin' London" hip. The strings and brass they employ throughout are suitably dynamic (thanks in no small part to the engineering skills of a young Eddie Offord) but it's so dated that you half expect Austin Powers to show up and exclaim "Yeah, baby!" Auger's "George Bruno Money" is nothing more than a corny, nostalgic big band number he dedicated to his "long-time mate and fellow tea-drinker," Zoot Money. Maybe some executive thought this could be a hit with the older generation or something but it doesn't fit here. "Far Horizon" follows and it's a bit of modern jazz that Brian wrote during "one of the bad periods that one inevitably encounters" and, alas, it sounds that way. Auger's limited voice is terribly off-key and the playing is uninspired. But it's a Grammy winner in comparison to the God- awful "John Brown's Body" that sounds like a throwaway, drunk-in-the-studio track that somehow found itself back onto the master. Embarrassing is the most flattering adjective I can attach to it. 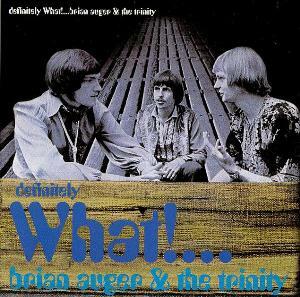 "Red Beans and Rice" is a spirited cover of a Booker T and the MG's instrumental where the group redeems themselves somewhat from the previous disastrous cut. "Auge" turns in a decent organ solo, drummer Clive Thacker and bassist Dave Ambrose lay down an extremely tight and flowing rhythm track and it's the only tune that I would deem worthy of repeated listens. The feeling I get from this song is that somebody at Auger's label had the bright but misguided idea of turning Brian into the British version of America's master of the jazz organ, Jimmy Smith, and gave the producers carte blanche to do just that. Close, but no cigar. Their take on Wes Montgomery's "Bumpin' on Sunset" is next and I like the piece although Auger would produce a much better version with his Oblivion Express ensemble several years down the road. "If You Live" is a cocktail bar-worthy blues/jazz ditty by Mose Allison where Brian provides a fair piano ride. The album-ending "Definitely What" instrumental is as close as things come to even approaching prog but it fails miserably to be entertaining. As Auger explains in the liner notes, it was developed from "the idea of trying to play the organ as a conga drum one night when my drummer Clive was missing somewhere in a cloud of smoke." That revealing quip should tell you all you need to know about this jumbled mess of unrelated solos and noodlings. I encourage all fans of jazz rock/fusion to explore the catalogue of Brian Auger's fine musical offerings but you should avoid this one like the plague unless you are a completionist because this ain't prog at all. In fact, it's not even a passable contemporary jazz record. Within the year the group would bring in the incomparable Julie Driscoll and record the vastly superior "Streetnoise" LP so I consider this no more than an unwise but valuable learning experience in his otherwise illustrious career. 1.4 stars.